The 2016 list of companies in the United States ranked by revenue continues to be dominated by Walmart which has occupied the top rank since 2002 with the exception of 2006 and 2009. Known as the Fortune 1000, the list is published each year by Fortune Magazine and lists companies headquartered in the United States ranked in terms of total revenue (see: Fortune 1000 list for 2016). In both 2006 and 2009, Exxon took the number one rank, pushing Walmart to the second rank. This year, Briggs & Stratton Corporation can be found as the last ranked company on the Fortune 1000 list, rank 1,000. As with the past few years (see 2015, 2014, and 2013), this article takes a cursory look at the geography of Fortune 1000 companies. Which states have the highest number of Fortune 1000 companies, which states have no Fortune 1000 companies, and which cities are home to the most companies. All of the locations are based on the headquarters for each of the Fortune 1000 companies mapped. The data presented here doesn’t represent the full information for Fortune 1000 listings, for more detail on each company visit Fortune.com. This tile grid map categorizes the number of companies by state and includes the District of Columbia (DC) and Puerto Rico (PR). The darker the shading, the higher the number of companies for that state. States that are shaded gray have no Fortune 1000 companies. 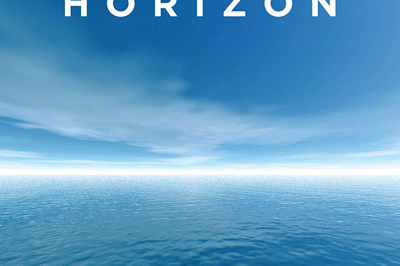 An interactive map that allows the user to explore Fortune 1000 headquarter locations can be found below. This interactive map shows the locations of Fortune 1000 headquarters. Users can pan, zoom in or out, and click on individual locations to access more information. For a list of Fortune 1000 companies (which allows you to filter Fortune 1000 companies by state) click here. Which States Have the Most Fortune 1000 Companies in 2016? As with past years, California, Texas, and New York are the states with the most Fortune 1000 companies headquarters. California has 108 companies, Texas has 100, and New York has 95. Only five states have more than 50 companies, with Illinois (64 companies) and Ohio (55 companies) rounding out the top five. 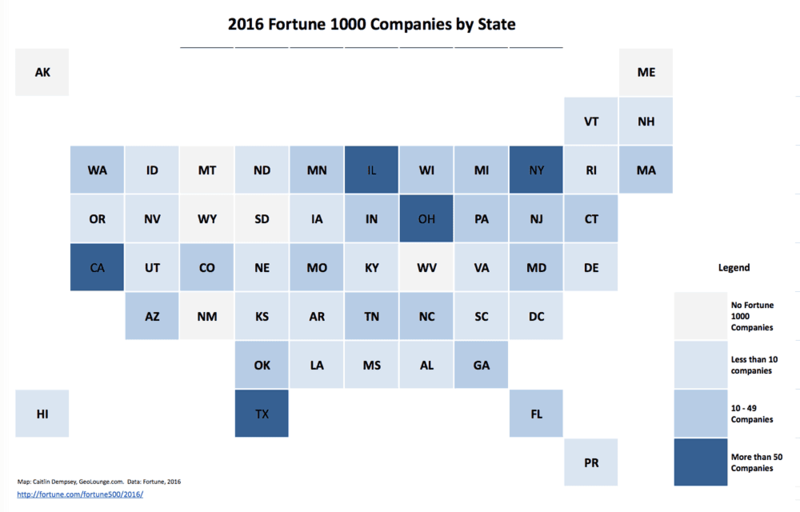 Which States Have no Fortune 1000 Companies in 2016? As with last year, seven states have no Fortune 1000 companies: Alaska, Maine, South Dakota, Wyoming, West Virginia, Montana, and New Mexico. Which Cities Have the Most Fortune 1000 Companies in 2016? Interestingly, California only has one city, San Francisco (ranked # 10 with 11 companies) within the top ten cities with the most headquarters. At look at the interactive map shown above shows that companies within California are distributed around the metropolitan areas of Northern California (San Francisco and the Silicon Valley) and the Los Angeles to San Diego Corridor. Overall, New York City is the top ranked city with 72 companies. Houston is ranked second with 42 companies. Atlanta (23 companies) and Chicago (22) are next in the rankings. Dallas with 16 companies rounds out the top five. 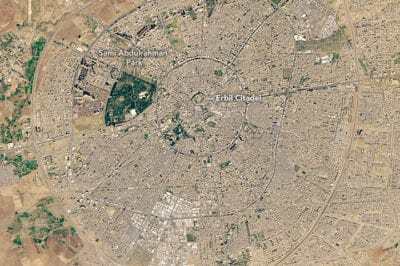 While the numbers differ slightly from 2015, the ranking order for cities remains the same.